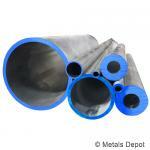 At Metals Depot Round Tube is available in aluminum, stainless steel, DOM steel, and welded steel. While all of these round tubes are easy to weld, their ability to cut, form, and machine vary based upon the type of metal. All round tube is available in stock and custom lengths with no minimum order required. 6061 Aluminum Round Tube is an extruded product that is easy to weld, cut and machine. It is frequently used when light weight and corrosion resistance are needed. With a smooth interior and no visible seam, it is frequently used for frame work, support columns, gates, fencing, and hand railings. It is available as an extruded product and drawn seamless aluminum drawn tube for higher precision applications. Shop for Aluminum Round Tube Online! Shop for Polished Stainless Round Tube Online! Shop for Stainless Round Tube Online! Round Steel Tube - DOM is a welded mechanical round steel tube ideal for more stressful applications requiring higher quality, increased mechanical properties, uniformity, strength and soundness. DOM Round steel tube has more dimensional accuracy and very smooth interior and exterior surface due to being drawn over a mandrel. It is used in race car frames, motorcycle frames, roll cages, engine mounts, telescoping and more. Shop for DOM Round Steel Tube Online! Round Steel Tube - Welded is economical structural grade tube used where dimensional accuracy and precision tolerance are not of primary importance. Easy to weld, cut, form, and machine, it is widely used for frame work, support columns, fencing, gates and railings, and much more. Shop for Round Steel Tube - Welded Online!